Beautiful Buildings of Bath and Somerset Skyline or Football Frenzy? 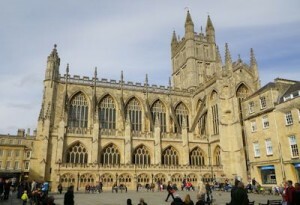 Researchers from the University of Bath have generated an energy “map” in order to ascertain the calories burned off by walking on the six mile “Bath Skyline” walk which curves around the World Heritage City in Somerset and takes two and half hours to complete. It has been downloaded from the National Trust’s website more than any other of the charity’s walks. The Bath Skyline walk loops around the hills above Bath and provides panoramic views of Bath, one of Britain’s most beautiful cities. The bonus, the research found, is that the energy burned off whilst undertaking such an activity is as great as playing 90 minutes of football…. although for which team, we are not sure. Specifically, researchers measured the calories given off by 22 persons between 24 and 69 undertaking the walk. On average, they burned 735 calories. This was the approximate equivalent to a typical 90 minutes of football. The walk indicates on the National Trust Website that it would take some 2 hours 30 minutes to 3 hours to carry out, undoubtedly dependent on fitness and propensity to dawdle. So when you’re planning your weekend’s excursions, why not factor in a trip round Bath? The photos adorning this article are all recently taken of the Bath area, which is truly one of the most picturesque and historically rich urban areas in the UK.